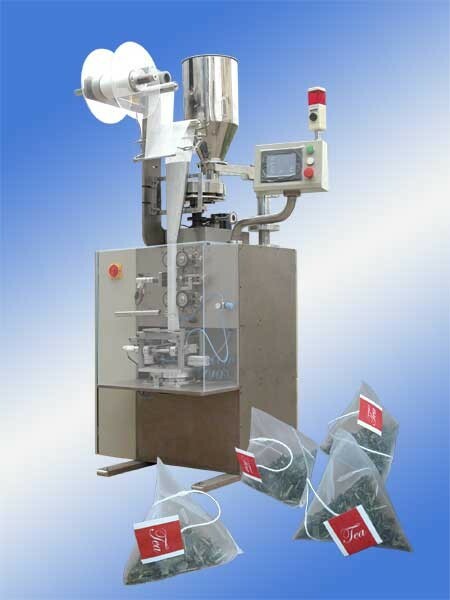 New Pyramid (Triangle Shape) Tea Bag Packing Machine Model CH-10D. Unit can use the following packing materials: non-woven fabrics and nylon filter fabric to produce pyramid bags. Length of bag: 50 - 80 mm (2" - 3.2") Size of bags: 60 - 90 mm width (2.4" - 3.6") to 40 - 80 mm length (1.6" - 3.2"). Width of material rolls sizes this unit can use is: 120, 140, 160 & 180 mm (4.8", 5.6", 6.4" & 7.2"). Sealing Type: Ultrasonic. Speed: up to 50 bags per minute. Air Pressure required: 0.6 MPA, Air Consumption: 200L/Min. Overall Dimensions: 1000 x 1000 x 1900 mm (40" x 40" x 76"). (weighing scale)Electrics: 1Ph/60Hz/220V. Delivery Time: 5-7 weeks from receipt of 65% deposit.